Renault is presenting the fifth generation Clio. Some 15 million units of the Clio have been sold since it was launched in 1990, and it has become Renault’s best-selling model worldwáide. It has also has risen to the top of the B segment (superminis ) in Europe since 2013. Now, a more modern and athletic new Clio is on the way. Renault says it builds on the strengths of each of the four previous generations. Designed according to the “evolution and revolution” principle, the French carmaker says the new Clio rewrites the rule book with more mature body styling and an entirely revamped interior. Featuring more sculpted lines and a more assertive front end, the Clio gains in vitality and modernity, while remaining instantly recognisable, despite the fact it comprises 100 per cent new parts. Inside, Renault says the revolution is strikingly clear. The completely redesigned interior is inspired by higher-end segments, both in terms of perceived quality and available technology. These strengths benefit all motorists, bringing them greater practicality and ease in use. Electric: By 2022, Groupe Renault will offer 12 electrified models in its range. The new Clio will be the first with its E-Tech hybrid engine based on technology developed by Renault. Connected: Also by 2022, the company is targeting 100 per cent connected vehicles in its key markets. The new Clio perfectly illustrates this momentum with its new connected multimedia system developed by the Alliance. Autonomous: By 2022, Groupe Renault will market 15 models equipped with autonomous driving technology. The new Clio will be a pioneer in this respect by making the driver assistance systems leading to autonomous driving widely available on a city car. Renault says the new Clio is central to the strategy aimed at strengthening synergies in the Alliance. This strategy notably hinges on the development of shared technologies and the use of new platforms, such as the CMF-B platform on which the new Clio is the first to be built, and its new electrical and electronic architecture. The platform can thus integrate the latest technologies to respond to new market requirements. In terms of size, the new Clio is 14mm shorter, but more spacious inside. The body has been lowered by up to 30mm for better aerodynamics and extra athleticism. The 17-inch wheels (depending on version ) enhance the new model’s dynamic look. Details such as the shark fin antenna, the 100 per cent LED lights, the flush tailgate and the chrome-plated side-window surrounds serve to modernise the exterior and improve perceived quality. Among the new body colours is the striking Valencia Orange. 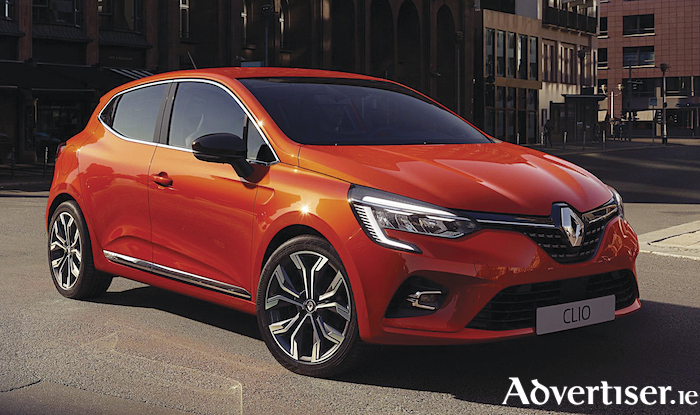 Renault says it embodies the new Clio’s vitality, the new tone offers unprecedented depth and radiance, thanks to a specific coloured varnish treatment making its first appearance in the automotive industry. Some other items to catch the eye include air deflectors on the front wheel arches. They serve to limit friction and boost aerodynamics, thereby reducing fuel consumption. As a bonus, they also lend a dynamic and sporty air to the design of the new Clio. And all headlights on the new Clio are now 100 per cent LED from the entry version. There will also be a new Renault Clio RS line with this generation. The new version is inspired by Renault Sport. It will gradually replace the former GT-Line. More on that closer to launch in the spring/summer. Page generated in 0.0968 seconds.